Orobpa, Qoqzaz… Is the “ISIS map” for real? No one has been able to give a source for this map. It just “appeared on the Internet” as a map of the “Islamic State” envisioned by the eponymous rebel army that has taken over cities in Syria and Iraq. Is this map for real? So many people have reposted it (including some so-called news sites), yet none of them know where it originated. So let me share what I can about the unfamiliar names the map gives for regions of a supposed Islamic State. Several of the names don’t make sense, while others are misspelled. The map boundaries also suggest that the mapmaker is unfamiliar with the geography of Africa, the Middle East, and South Asia. These facts make it unlikely that the map represents anything authentic. More likely, it was made to generate fear, either by an armchair ISIS supporter (like this guy) or by an Islamophobe (like these people). Andalus is the Arabic name for the Iberian Peninsula (Spain and Portugal), much of which was under Muslim rule for centuries, from 711 to 1492. The Spanish region of Andalusia gets its name from the Arabic. But Muslims never ruled all of Iberia, as this map pretends. Hijaz (Arabic: الحجاز‎ al-Ḥiǧāz, literally “the barrier”) really is the historic name for the western coast of Arabia, on the Red Sea. This is the homeland of Muhammad and the location of Mecca and Medina. This map, though, extends “Hijaz” all the way across the peninsula to the marshy east coast on the Persian Gulf. This is sort of like including California in the American Midwest. It suggests profound ignorance of the actual geography and history. Khurasan (more commonly spelled Khorasan) is a very old, pre-Islamic name for the eastern reaches of the Persian Empire. On this map it is used to take in the majority-Muslim countries of Afghanistan, Pakistan, and the five post-Soviet republics in central Asia, each of which have their own distinctive languages and cultures. Bizarrely, the map also shoves India, the world’s second largest country, into “Khurasan,” but it fails to include neighboring Bangladesh. India is less than 14 percent Muslim; Bangladesh, more than 86 percent Muslim. Whoever made the map apparently doesn’t know that. Kordistan is a misspelling of Kurdistan. it is supposed to correspond to the territory within present-day Turkey, Syria, Iraq, and Iran that is occupied mainly by ethnic Kurds. Considering how diligent the Iraqi and Syrian Kurds have been in fighting against ISIS, it seems unlikely that Kurds would be rewarded with their own contiguous state. That suggests that this map did not originate within ISIS. Land of Alkinana: OK, I’m stumped. This area includes Egypt, which is Misr in Arabic (pronounced Masr in the Egyptian dialect). Alkinana seems to come from the name of an Arabian tribe (Banu Kinanah) that claims descent from the prophet Elijah. But I could not find any link between any version of the name “(al-)Kinana,” on the one hand, and Egypt or northeast Africa, on the other. Maghreb (Arabic: المغرب‎, al-maġrib) means “sunset, west” and is the name of the country we call Morocco. This map projects that name over all of West Africa, ignoring other historic Muslim names for those regions. “Maghreb” properly refers only to the (northern) Mediterranean coastal region of West Africa, where Arabs and Berbers form the majority. The western Atlantic coast is Mauritania, not Maghreb. The interior, of course, is mostly uninhabitable desert. Sahel is the Arabic-derived name for the arid but habitable zone south of the Sahara. And once again, it is absurd to include the densely populated, mostly non-Muslim southern coastline of West Africa in an “Islamic” domain. Added on 4/28: The Arabic for Europe is أوروبا or Euruba. My best guess is that “Orobpa” is an ignorant misspelling of this name. Finally there’s Yaman (or Yemen) in southern Arabia. It’s anyone’s guess why Yemen gets its own domain while other Arab states — say, Oman — do not. Possibly it’s because Yemen often makes the headlines these days because of civil war, terrorist bombings, and U.S. drone strikes, so it’s considerably scarier than Oman. 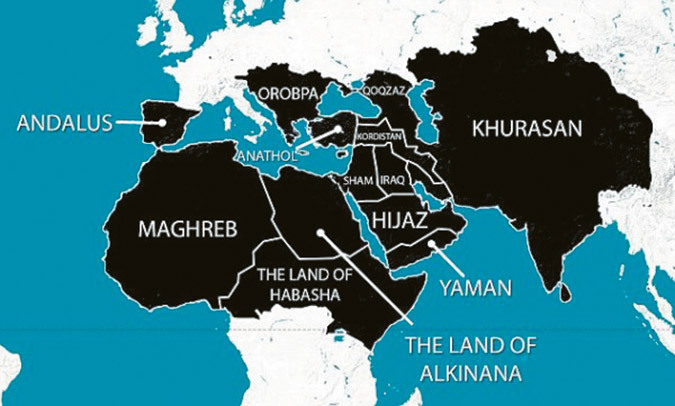 It’s hard to overstate how silly this “ISIS map” is. I believe it relies on Americans’ (and others’) unfamiliarity with world geography and Islamic history to push across some absurd ideas. Let me make a comparison with the United States. Imagine a map that took in the entire South, from the Chesapeake Bay to the Texas shore of the Gulf of Mexico. The name of that vast territory is “the Land of Smokey Mountains.” That’s how this map’s “Land of Habasha” seems in its African context. Now draw a crude boundary around the northeastern states. Heck, throw a bunch of Canada in there as well. This territory is called, oh, I don’t know, “Narnia.” Welcome to the “Land of Alkinana” in northeast Africa. Apparently he ran out of ideas for names, too, because he forgot to name the remnant of Iran on the north shore of the Persian Gulf. That probably also explains why he crammed so many large countries under the heading “Khurasan.” He was out of ideas.